Being one of the most distinguished names in the industry, we are engaged in manufacturing and offering a wide range of Pool Nets. 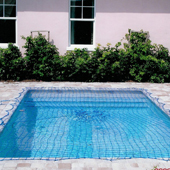 These nets are widely used to cover swimming pools as it keeps the pool water clean. Our offered range is made by using high quality base materials and sophisticated machines. We are widely appreciated for exporting a wide range of safety nets to countries like Dubai and USA. Available at very affordable prices, these Pool Nets are widely appreciated due to their distinguished features such as light weight, durability and long service life.